DO YOU OWN A CLIMBING PARK? Do you own a climbing park, but can your customers not yet easily book a time slot online through your website? Or do you use a system that does not offer the options you would like? Try out the CRM system of LeisureKing. In 3 steps your climbing park can be available for online booking tomorrow! The customer can book and pay immediately, significantly decreasing the number of e-mails and phone calls for you to answer. You will have time to spare! All bookings are listed in a transparent overview, allowing you to see immediately who has booked what and for which times. And because the customer can pay in advance, you will have no more trouble with no-shows. And rest assured, because offline booking is still available. If a customer calls you or walks in, you can very easily add a booking manually. 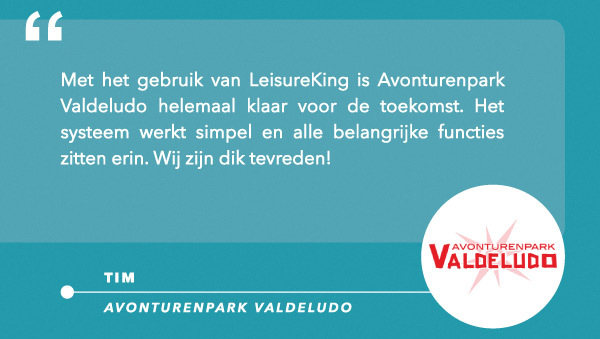 LeisureKing was fully developed based on personal experience (Klimbos Garderen). First, you need to set and enter the time slots. Then, when someone books a slot, the number of available spots per time slot is automatically adjusted. This keeps your offer up to date, and double bookings become a thing of the past. By using the LeisureKing discount codes, you can also give discounts per time slot for special promotional campaigns. LeisureKing does not require you to redo your entire website to make online booking available. You only have to add a small window. You can even customize this window to fit the style of your website. No big changes required! Of course, you do not even have to make your climbing park available for online booking all by yourself; we are more than happy to help you personally. You can add multiple locations and/or users free of charge for a complete overview in a single system. All your employees can also see which bookings have been made. Your climbing park can also automatically be offered on various external websites and platforms. For example, your climbing park can then be booked at hotel receptions, campsites, bungalow parks and tourist information offices in your area, by using de Front Office app. Our system lets you easily reach a much larger audience. And what about the deposit and upsell possibilities? Naturally, we thought of those too!